The Mighty World sets from International Playthings have some great accessories that can be used in 1:12 miniature modern designs. Although I'm sure someone somewhere is using the accessories in the Construction series to outfit a miniature modern garage setting, I prefer the Town Life series. I’m quite partial to the fruits and vegetables available in the Farmer’s Market set. They are well made and very close in quality to those you can find in Japanese candy toys. I’m also fond of the dishes available in the Dinner Time and Baking Time sets. The silver pots and pans look like a pro-chef series when in a 1:12 modern setting. 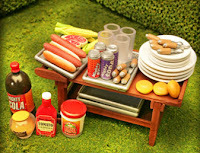 The various Barbecue sets have some decent looking steaks and condiments. The Dessert Cafe has desserts and dishes that can be used, as well as a good looking coffee/espresso maker. As most know, it’s the accessories in your miniature design that make it come alive. The Mighty World sets generally cost between $4 - $50. Mighty World is da bomb. The people are more-or-less 1:24, if one isn't too fussy or doing too delicate a house. Should you stumble over a mini-Bratz play set (Big Lots got them for a while), those can effectively be cannibalized for accessories and furniture that are somewhere in the 1:18 to 1:12 range. Ha ha--Oh Yes! If you look closely at some of the mini modern scenes, there are several Lil Bratz pieces in there. The earlier produced pieces were the best. It seemed as if the quality went down as the Lil Bratz sets progressed. I sm thrilled that there are mini artist out there who are interested in modern homes and not the run of the mill dollhouses. I am working on a victorian now but when done I am going to build a ultra modern home. Thanks and keep up the great blog!!!! Love your site. I found it through www.dreamdollhouse.blogspot.com, another modern dollhouse blog. Lego has some interesting modern buildings...Lego City and Lego Creator series. There is a townhouse and beach house and more. Greenleaf has brought back the modern Brookwood dollhouse because of popular demand.